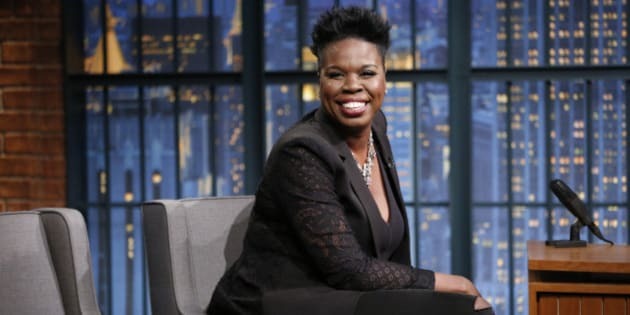 Leslie Jones resigned from Twitter this week, and it's not at all surprising. She's been subject to one of the most virulent attacks by social media trolls that the Twitterverse has ever witnessed. And why was Ms. Jones the subject of such a horrific attack? It's because one infamous troll (who shall remain nameless, and who was subsequently banned for life by Twitter) decided to focus his venomous attention on her and to sic his brainless acolytes on her. Why did he do this? It's very simple. Leslie Jones doesn't conform to a certain reactionary set of conservative male expectations. For a particular group of men -- let's call them the bullies whose agenda it is to dominate and regulate male-female interactions -- a woman is only allowed to present herself to the world in one way. She must be petite, slender, yielding and submissive; she must be quiet, meek and all too eager to please men, even men she has nothing to do with. To these fascist males, an "acceptable" woman must always be conventionally attractive, at least by their narrow, Aryan standards, (notice all the blue-eyed, blonde-haired anchor-women on FOX News, anyone?) and she must shut up and take whatever hassles or harassment she receives. She must smile brightly when subject to contempt or derision, and not "make a fuss" when she's called demeaning names such as "honey," "dear," "babe" or even "b****." And she must be white, or at least, light-skinned. Leslie Jones is none of these things. Tall, normal-sized, strong and assertive, she speaks her mind and doesn't take any crap. She flirts overtly with the men whom she finds attractive, whether in her spots on Saturday Night Live or in the TV commercials she performs in. This might not be her true personality, but it's her persona, and those trolls were terribly threatened by it. To men like this, a woman such as Ms. Jones should be neither seen, nor heard. And this is why they had to go out of their way to try and bully her into submission. According to the distorted rules of these fascist trolls, a non-traditionally attractive, dark-skinned woman has no right whatsoever to see herself as the equal to a handsome young man, or indeed, as the possible object of his desire. Leslie Jones isn't conventionally beautiful by 2016 Rich White North American Male standards, but I thought that she rocked her beautiful red dress the other day at the Ghostbusters premiere. Leslie Jones has dark skin, and perhaps no one will admit this out loud, but being a dark-complected female is considered, by certain horrible, troll-like men, as undesirable and unattractive. "How dare she?" they think when Ms. Jones stands tall and proud at her premiere, wearing a gorgeous Christian Siriano creation, and lets in all the accolades for her slam-dunk performance in the film. In this era of hatred and violence we need more love, not more bullying. In this era of hatred and violence we need more love, not more bullying. Although a huge racist backlash was unfortunately stirred up when the wonderful President Barack Obama was elected -- and which is being further stirred up now that a woman, Hillary Clinton, dares to vie for the role of U.S. president -- we must try to be our best selves today, not our ugliest selves. Sure, we human beings can easily resort to being stupid, petty, hateful bullies, but we're also capable of being, kind, compassionate, caring, inclusive individuals who love and support one another regardless of our differences. I know which version of myself I prefer to be. Well, they might have scared Ms. Jones off Twitter -- and perhaps Twitter deserves this loss for failing, time and again, to protect its users from bullying and abuse -- but I hope for the sake of all humankind that she is not cowed by this experience. In an era which supposedly celebrates diversity, let us embrace the diversity of what makes a person beautiful, inside and out. Let's see a tall, not-skinny, dark skinned comedian who is a lovely individual with fantastic talent and an amazing sense of humour as equally beautiful, if not more so, than a petite, pale, pouty-lipped, vapid celebutante. Sign up here for my free wellness newsletter. July is all about living your best life. Listen here to my latest podcast, with Michael Ballard, who talks about overcoming adversity and developing resilience.